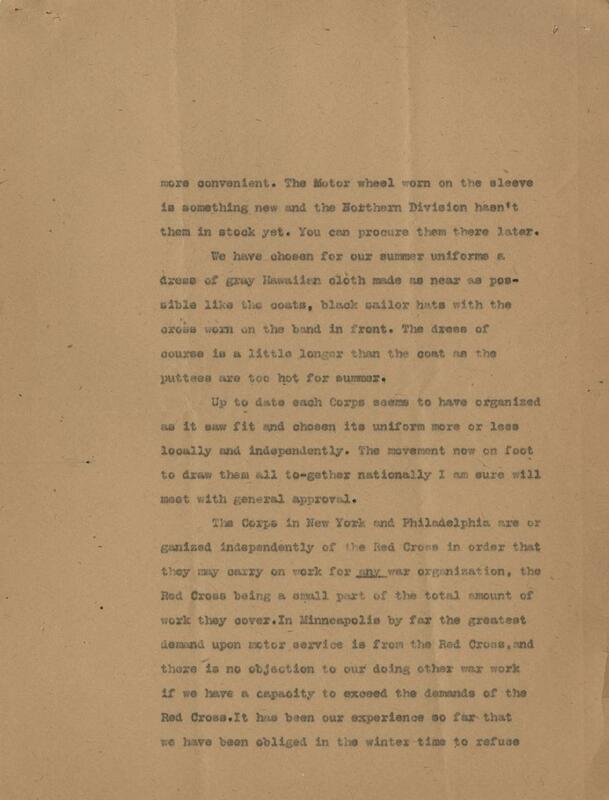 This letter from the Minneapolis Chapter of the American Red Cross describes the uniform for their motor corps, which at the time was not standardized. 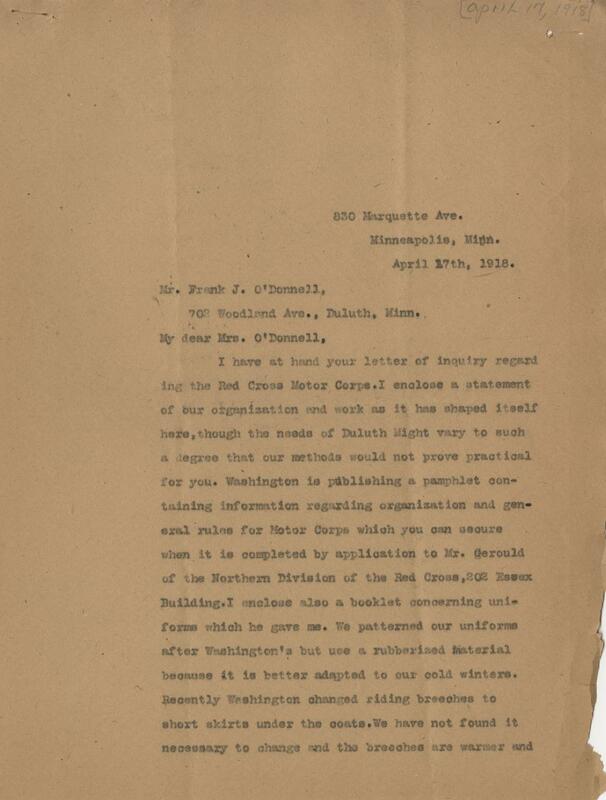 The motor corps itself was not standardized either, though actions were moving toward standardization. Their uniforms were based off the Washington branch's, but used breeches in the winter instead of short skirts, and was made out of rubberized material in winter for extra warmth. 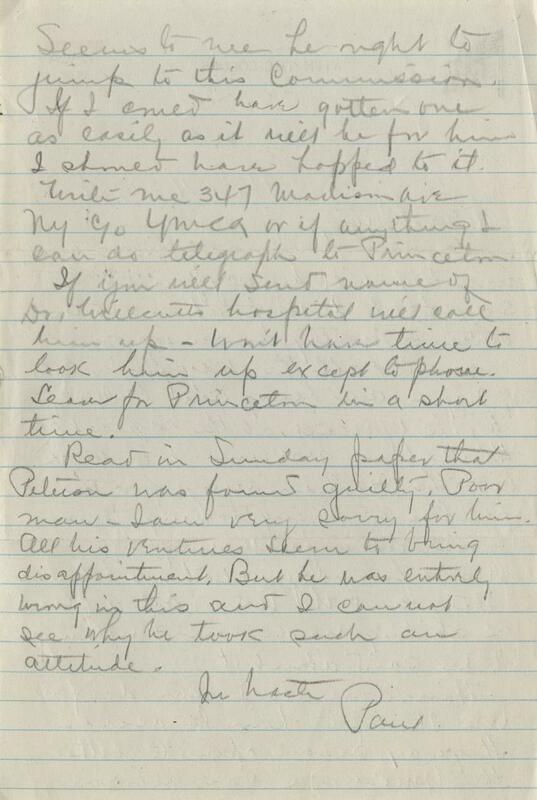 Paul Thompson writes to his sister Ruth to tell her some more specifics about his impending trip to Italy. 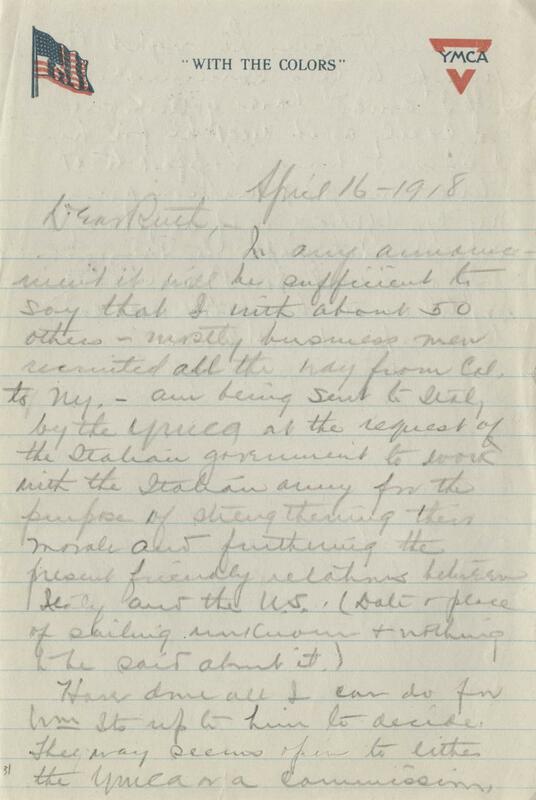 He writes that the Italian government has requested the YMCA work with them to strengthen morale and "further friendly relations" between the US and Italian governments. 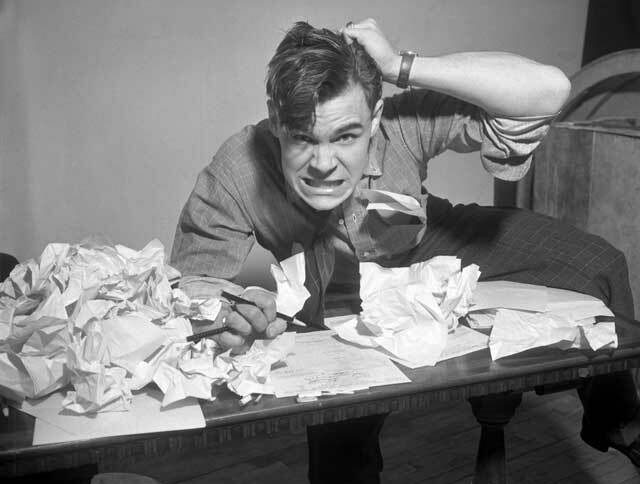 This photo shows a man having trouble with his 1937 income tax return. Remember, you have until Tuesday, April 17! Photo by Minneapolis Star and Tribune Company. 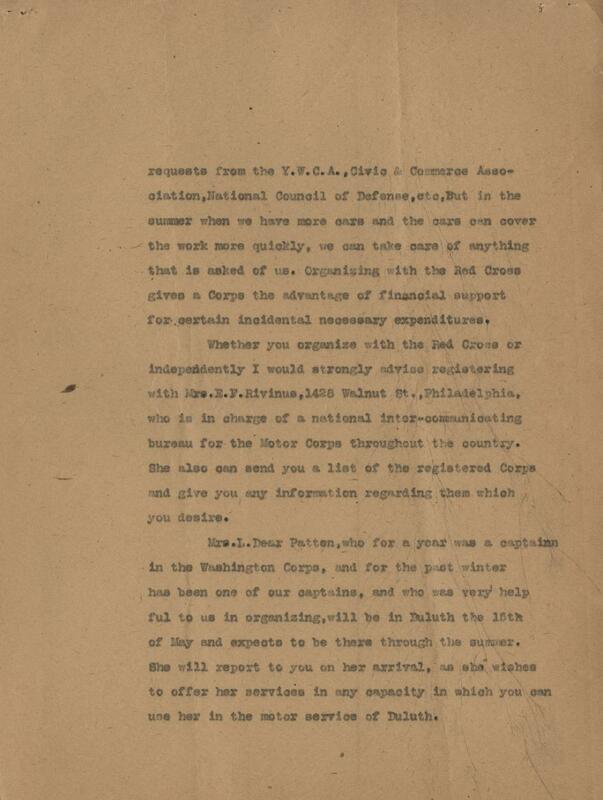 This letter was sent out to presidents, trial judge advocates and assistant trial judge advocates involved in court martials at Camp Dodge, Iowa. 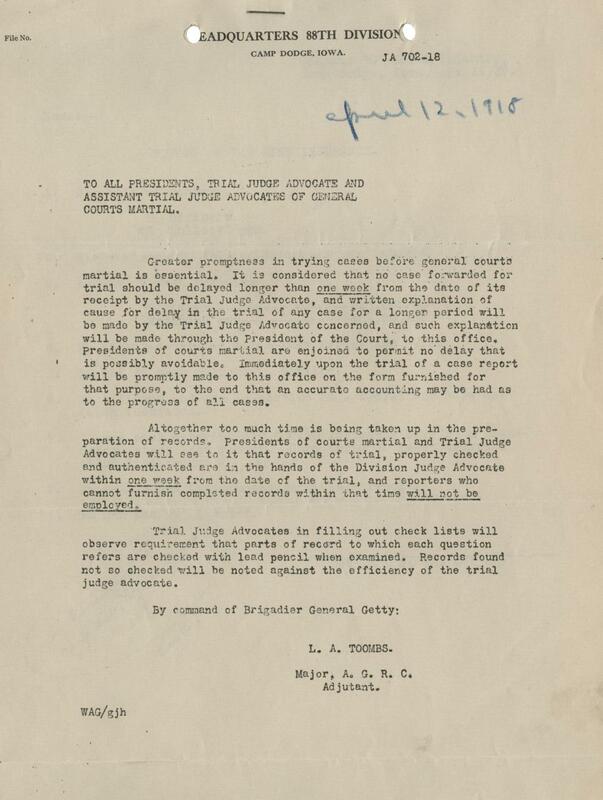 It states that the Court Martial process is moving too slowly because the acquisition of the documents is taking too long. 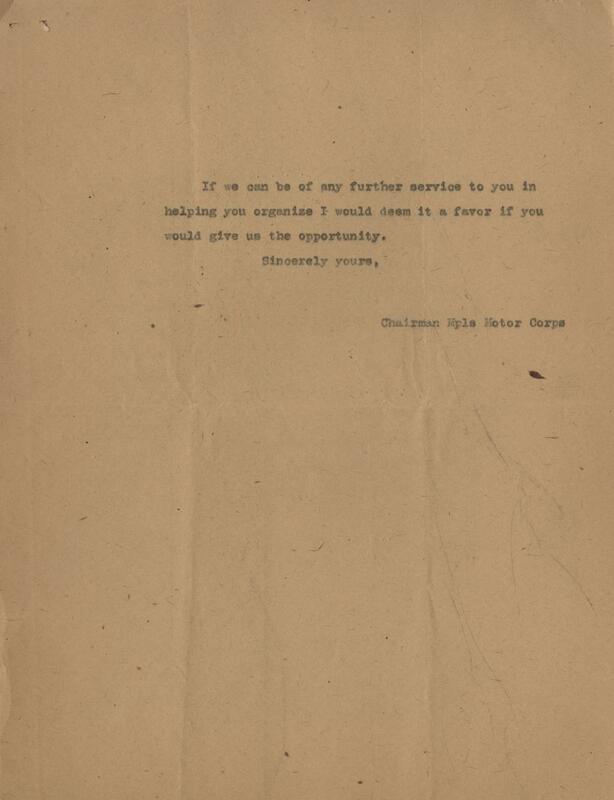 The letter goes on to say that document acquisition should not take more than one week and that those who cannot make that timeline work will no longer be employed. TO ALL PRESIDENTS, TRIAL JUDGE ADVOCATE AND ASSISTANT TRIAL JUDGE ADVOCATE OF GENERAL COURTS MARTIAL. Dennis J. Banks was born on Leech Lake Indian Reservation on this day in 1937. 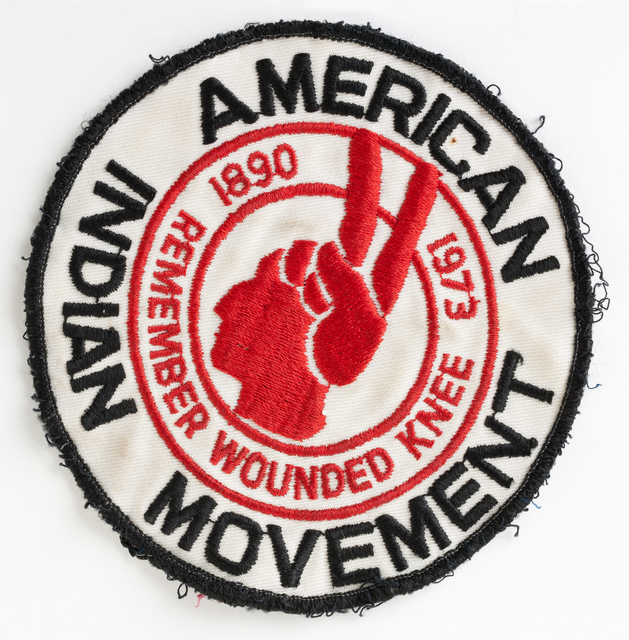 An Indian activist, he would become one of the founders of the American Indian Movement (AIM) in 1968 along with Clyde and Vernon Bellecourt (from White Earth Reservation) and George Mitchell. This patch is from 1973. This letter was sent from the St. Paul Chapter of the American Red Cross to the Duluth Chapter, warning of a potential scammer in their city. 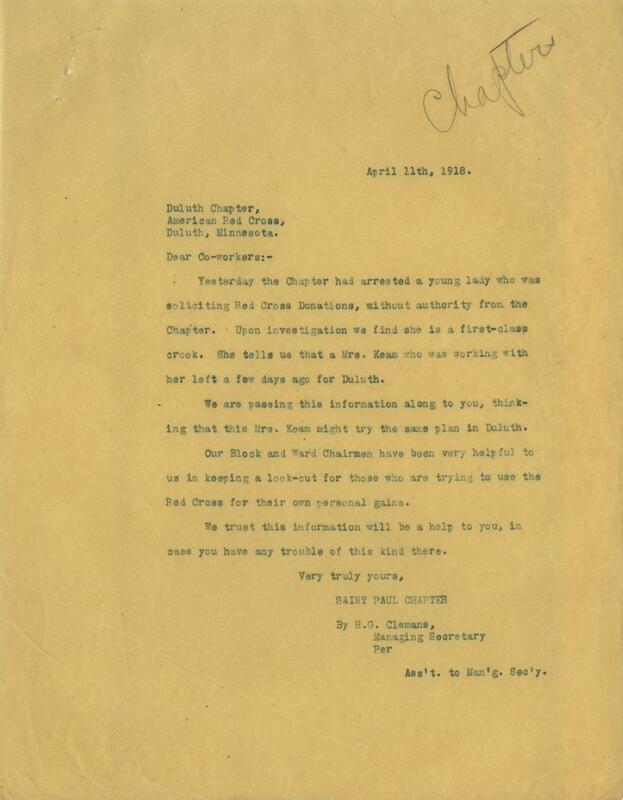 It states that they caught a young woman soliciting funds for the Red Cross without authority to do so, and discovered the woman was a crook. The woman claimed she was working with a "Mrs. Keam", who was headed to Duluth, likely to continue the scam there. The Duluth chapter responded on April 17th that they were also dealing with crooks taking advantage of the "magic name" of the Red Cross to ask for money. Yesterday the Chapter had arrested a young lady who was soliciting Red Cross Donations, without authority from the Chapter. Upon investigation we find she is a first-class crook. She tells us that a Mrs. Keam who was working with her left a few days ago for Duluth. We are passing this information along to you, thinking that this Mrs. Keam might try the same plan in Duluth. Our Block and Ward Chairmen have been very helpful to us in keeping a look-out for those who are trying to use the Red Cross for their own personal gains. We trust this information will be a help to you, in case you have any trouble of this kind there. We conveyed the information contained in your letter of the 11th to the authorities. We have similar troubles here, as the crooks are quick to take advantage of the magic name of the Red Cross in securing funds. 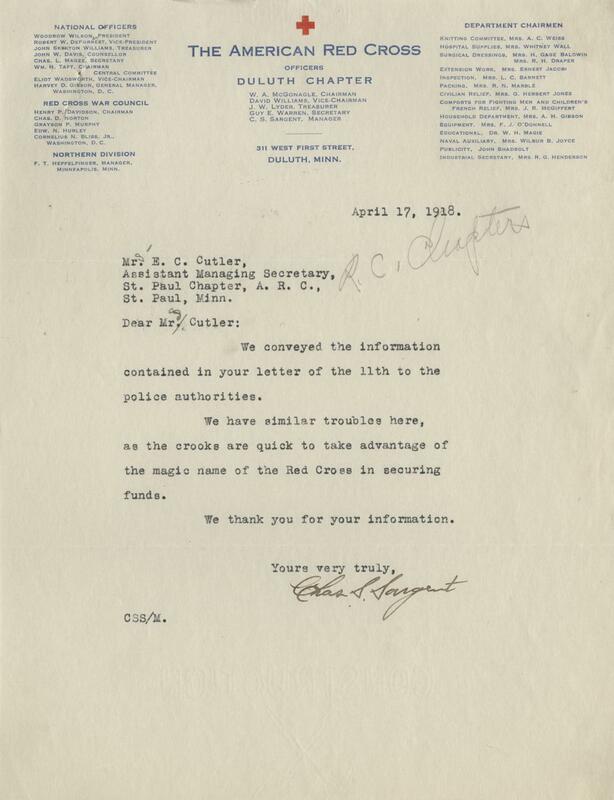 We thank you for your information. 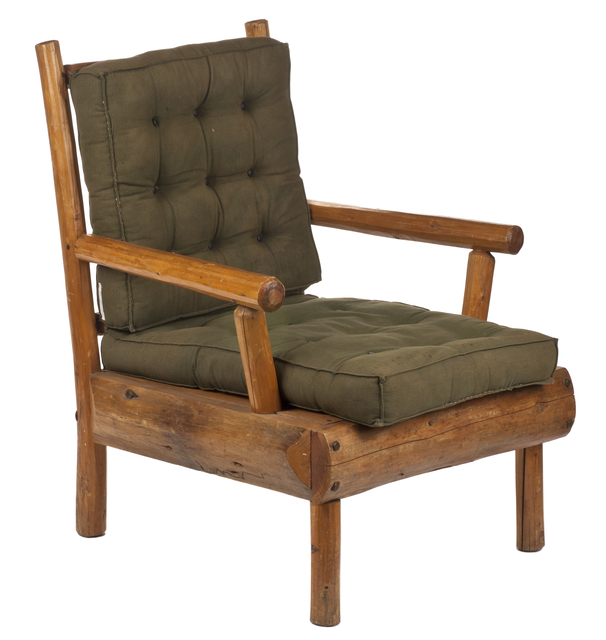 This armchair was part of a set of Tettegouche State Park camp furnishings, ca. 1920-30.